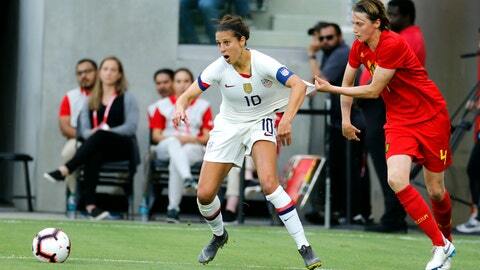 LOS ANGELES (AP) — Carli Lloyd realizes millions of casual soccer fans don’t follow the international game outside the World Cup. Some American fans haven’t paid close attention to the U.S. women’s national team since Lloyd got her iconic hat trick to win the Final four years ago in Vancouver. But the 36-year-old Lloyd isn’t settling for the role to which she has been largely relegated over the past two years. Her latest performance suggested that maybe coach Jill Ellis shouldn’t settle for it, either. Lloyd seized the spotlight at Banc of California Stadium on Sunday night, evoking memories of her greatest performances and decisively showing she can still deliver in the U.S.’ No. 10 jersey, typically reserved for every team’s top playmaker. Lloyd then set up a goal by Alex Morgan, demonstrating her playmaking ability along with her finishing skill. With hundreds of fans wearing Lloyd’s jersey in the boisterous crowd of 20,941, their hero partly stole the show from even the 1999 World Cup championship team, which was honored on the field at halftime. Lloyd played with a few of the 99ers early in her career, and she forged her own standard in the game with back-to-back FIFA Player of the Year awards and that World Cup star turn. She became a household name and an icon of women’s sports, dabbling in everything from worldwide endorsement deals to writing her autobiography. Ellis’ decision to scale back her playing time has clearly fueled Lloyd, who previously acknowledged her disappointment with limited minutes. She had played only 34 minutes this year before Los Angeles, coming off the bench in five games. Ellis must settle on her final World Cup roster in the next few weeks, so those decisions are taking up much of her time. When asked about Lloyd’s potential to play her way into a bigger role, Ellis gently deflected the notion, noting that Lloyd already has an important part to play in France.